On the right-hand side of the shrine, you will see Radha-Krishna deities, named Sri Sri Radha-Londonisvara (the Lords of London), by Srila Prabhupada. They are the principal deities at our Temple. Installed by Srila Prabhupada in 1969, They are the movement's first full-size marble Radha-Krishna deities. Srila Prabhupada himself supervised Their installation on 14th December 1969 at Bury Place (opposite The British Museum). He was very fond of These deities. When asked who were his favourite deities, he replied, on more than one occasion, that Sri Sri Radha-Londonisvara were the most beautiful. 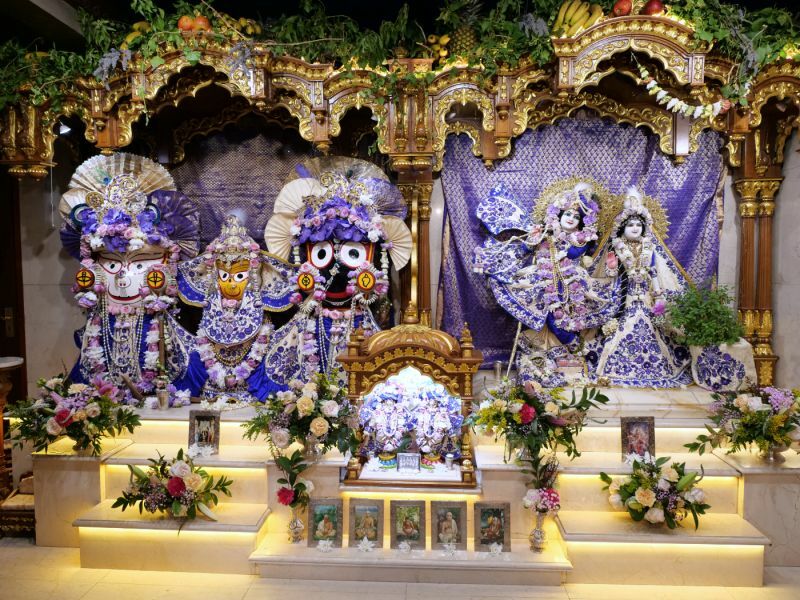 Through the installation of Radha-Krishna deities in London, Srila Prabhupada had fulfilled a long-standing order of the previous spiritual masters in our lineage. They are one of the most prominent set of deities in the entire western world. Near the feet of Sri Londonisvara is Giri-Govardhana - a small sacred stone that is worshipped to honour Govardhana Hill - the holy mountain in Vrindavana in India - which was lifted by Lord Krishna as a child. On the left-hand side of the shrine, you will see Lord Jagannath (another form of Krishna on the right-hand side of this part of the shrine), Lord Baladeva (Krishna's brother, on the left-hand side) and Lady Subhadra (Krishna's sister, in between Jagannath and Baladeva). They were hand-carved in London in 1968 by Shyamasundara dasa, who was one of the original six devotees who came from the US to the UK, under the order of Srila Prabhupada to establish Krishna Consciousness here. These unusual deities are based on the original deities in Jagannatha Puri located in Orissa, India. In the centre part of the shrine, you will see Sri Sri Gaura-Nitai - the incarnations of Krishna and Balarama - and who are the propagators of harinama sankirtan which is the process for spiritual perfection in this age.